As an independent insurance agency, allow us to help you sort through the maze of coverages and companies in the market today. We can tailor an auto insurance package to suit your specific needs and budget.Our auto coverage will provide liability for an accident and can take care of you and your car if it is damaged or stolen. Other options are available to provide peace of mind and additional protection. We provide dependable coverage with outstanding service at a fair and competitive price. 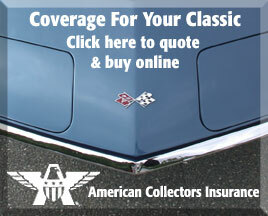 Classic Car Insurance—Agreed Value coverage for collector and antique cars, trucks and motorcycles (any year) may qualify. We also offer competitive rates for modified cars (street rod, hot rod and other customs). Collectibles Insurance—Typically standard homeowner’s insurance policies do not cover collectibles. This optional coverage can provide specialized insurance for your specialized collectibles. We will help you protect one of your most valuable assets. By reviewing and evaluating your home property, we can aid you in establishing your home's replacement value and insure it properly against loss. Choose the property loss deductible best suited for your financial needs. Proper liability limits will also help protect your financial resources. And don't forget replacement cost coverage on your contents, including valuables like jewelry, coin and stamp collections, silverware, antiques, and home computers. Protect your personal property inside your apartment with renter's insurance. A renter's insurance policy provides broad coverage for your contents and includes important personal liability protection. Select your coverage limits, deductible, and liability coverages for your personalized package. And don't forget replacement cost coverage on your contents, including valuables like jewelry, coin and stamp collections, silverware, antiques, and computers.